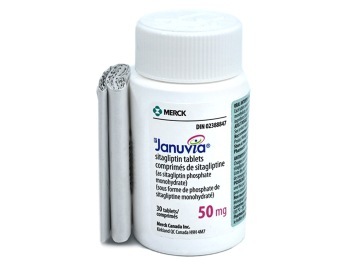 Januvia (generic name: Sitagliptin) is a prescription drug which is an oral form of diabetes medication. In patients with diabetes, the liver does not produce enough insulin, and therefore synthetic insulins are prescribed to regulate blood sugar levels and prevent a spiking in blood sugar. Januvia belongs to a new group of drugs called dipeptidyl peptidase-4 (DDP-4) inhibitors. It helps to the blood sugar levels of diabetics, and works by regulating the levels of insulin produced in the body after eating. Januvia is prescribed for type 2 diabetes only, as it is not effective in type 1 diabetes. It is commonly used in conjunction with other diabetes medications as part of a treatment program. As with any drug, there may be side effects from taking Januvia which may include runny nose, nausea, headache, stomach pain and dirrhea. More serious side effects may include fever, strong headache, sore throat, sever blistering of the skin, red skin rash and pancreatitis which is a severe stomach pain that spreads to the back. Other may include vomiting, change in appetite and increase in heart rate. If you experience any side effects you must seek medical attention immediately for safety. You should follow the instructions of the doctor who prescribed Januvia to you, and there will also be information and dosage on the pack. Januvia tablets should be swallowed with water and can be taken with or without food. Do not exceed the stated dose. The recommended dose is 100mg per day, although you should take the advice of your doctor as more or less may be required depending on your individual circumstances. If you are allergic to any of the ingredients of Januvia do not take it and inform your doctor. You should consult your doctor before taking Januvia if you have any pre-existing medical conditions including kidney or liver disease or a history of pancreatitis. You should also consult your doctor if you are taking any other medications as they may interact with Januvia, including NSAIDs, sulfa drugs, MAOIs, beta blockers, probenecids or asprin and salicylates. You should check blood sugar levels regularly, and be aware of the signs of hypoglycemia (low blood sugar) which are headache, hunger, shakes, irritability, dizziness, feeling weak and sweating. If you feel that you are experiencing hypoglycemia you should eat or drink high sugar products such as chocolate, fruit juice or glucose gel and contact a doctor. Consult your doctor if you are pregnant, planning to conceive or breastfeeding.